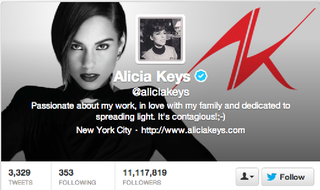 BlackBerry unveiled Alicia Keys as its new spokesperson, but turns out she's been posting from her iPhone. Seems a little dubious, but we'll see. Sure it's launch day, but it's a little odd considering Alicia came on stage with Thorsten Heins and made a long, drawn out metaphor about being in an exclusive relationship with Blackberry. She said she had been openly using a non-BlackBerry phone (an iPhone according to TweetDeck), but that she's broken up with said non-BlackBerry device. And her latest tweet announcing the partnership was actually sent from the web. However, the Z10 wasn't official before today. Obviously they're paying Mrs. Swizz Beatz to be the spokesperson, but is this a consensual relationship or just business?